The Gate of Mazeus and Mithridates to the Lower (Commercial) Agora. 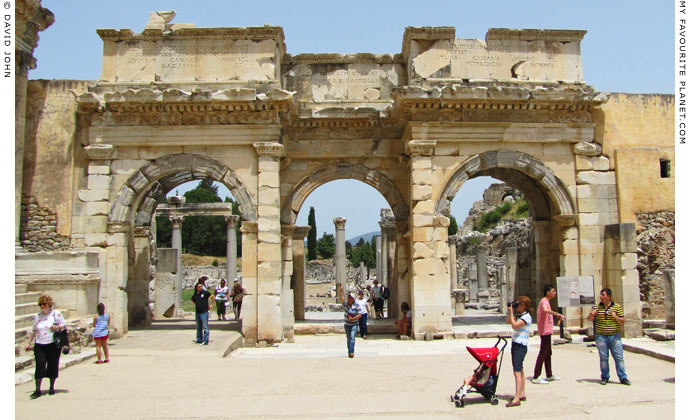 The monumental triple-arched gateway (also known as the Gate of Augustus, or the South Gate) stands to the southeast corner of the Lower (Commercial) Agora (also known as the Tetragonos Agora), on the north side of the square of the Library of Celsus. 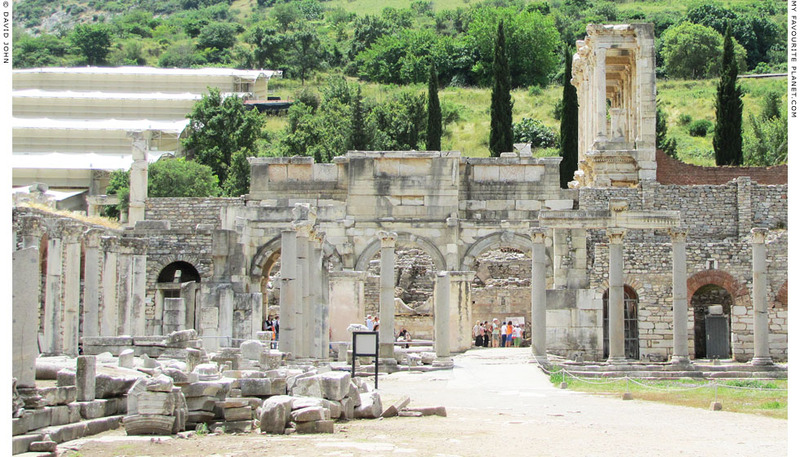 It was built around 4-3 BC and dedicated by two former slaves, Mazeus and Mithridates, who had been freed by Emperor Augustus (reigned 27 BC-14 AD) and apparently become very prosperous in Ephesus. 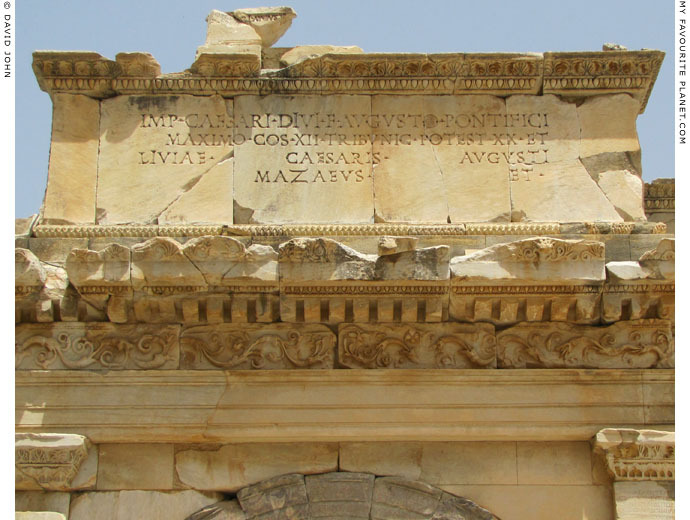 See photos below of the inscriptions dedicated by Mazeus and Mithridates to Augustus and members of his family : his third wife Livia Drusilla, his daughter Julia (Julia the Elder, by his second wife Scribonia) and her husband Marcus Vipsanius Agrippa. 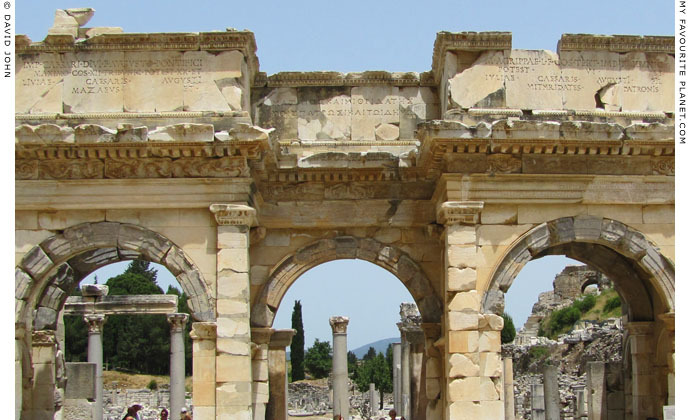 It was designed in the form of a triumphal arch, and richly decorated at the front and within each of the three arched passages, which are connected to each other by doorways with skylights (see next page). See a photo of a relief of Aphrodite on the central arch of the gate on the next page. The back of the gate is quite plain (see photo below). During the reigns of Emperors Claudius (41-54 AD) and Nero (54-68 AD) alterations were made to the gate, an extension was built on the north side, and it was intergrated into the newly redesigned agora, the ground level of which was raised 2-3 metres. Over the centuries various inscriptions with market regulations and other official announcements were added. The building collapsed during an earthquake in the 13th century. The Gate was first excavated in 1903 and restored 1980-89 (see below), using original parts discovered during the 1903 excavation. 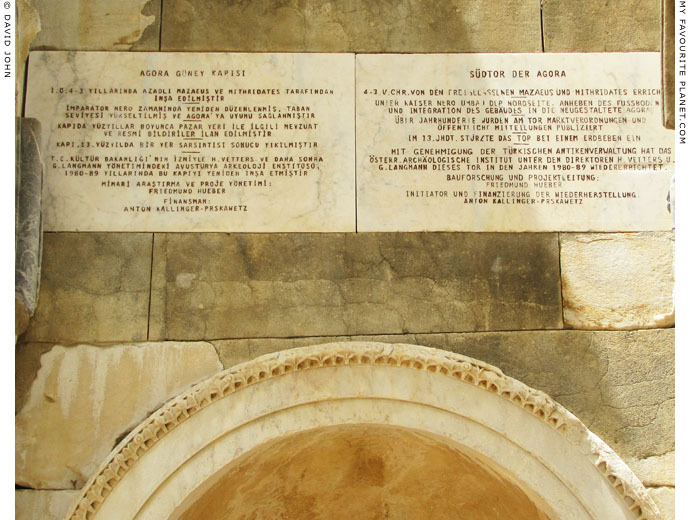 A marble slab with an inscription mentioning Mithridates Agrippa can be seen on the ground, on the other side of the square on which the gate and Library of Celsus stand. The inscription is thought to be from the grave of the Mithridates who had the gate built. 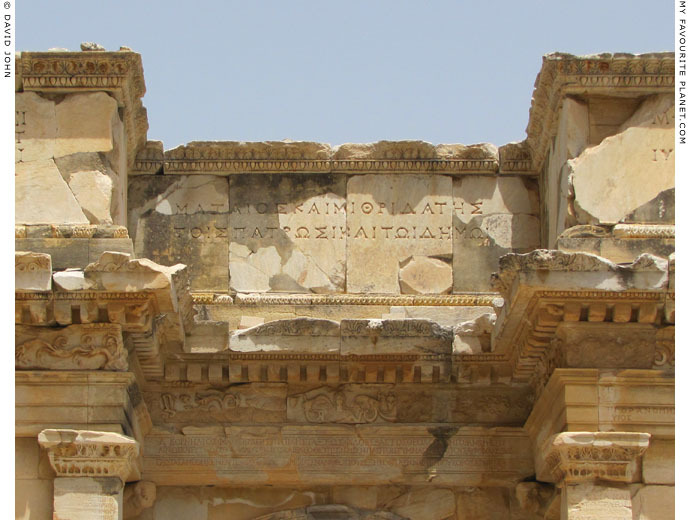 The dedicatory inscription of Mazeus and Mithridates in three parts above the gateway. daughter Julia (Julia the Elder). The first is signed by Mazeus, the second by Mithridates. The central inscription is in Greek. The letters were originally inlaid with bronze. and Julia, daughter of Caesar Augustus. Mazeus and Mythridates to their master and the people." The photos below show details of the inscriptions, all to approximately the same scale. The western inscription, over the western arch (on the left) of the gate, signed "Mazeus et". The signature of Mithridates is over the eastern arch (on the right, see below). The inscription in Latin mentions Augustus and his wife Livia Caesar Augusus (Livia Drusilla). in Greek, by Mazeus and Mithridates to their patron and the demos (city). and a long inscription in Greek. See the photo on the next page. 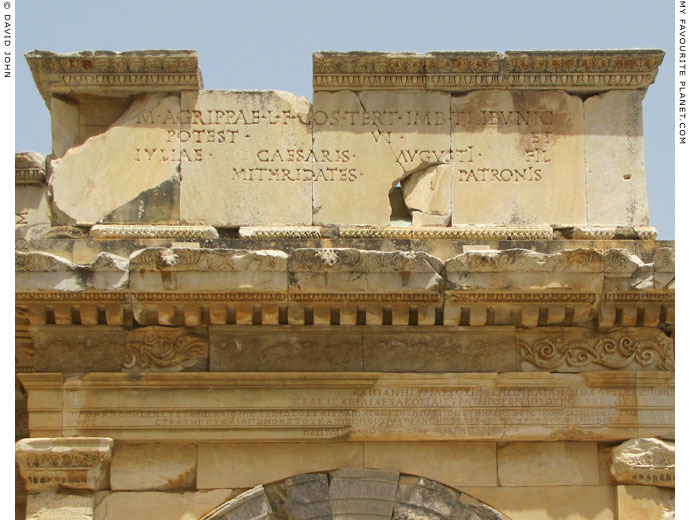 The eastern inscription, over the right arch of the gate, signed "Mithridates". Marcus Vipsanius Agrippa. Agrippa was one of Augustus' most trusted generals and political allies. honoured in many cities of the Roman Empire. on Athens Acropolis gallery, page 8: The Pedestal of Agrippa. which were often used to precede the main text of official inscriptions and decrees. See also the photo on the next page. project director: Friedmund Hueber. Initiator and financing: Anton Kallinger-Prskawetz. 1. For further information about the complex relationships and genealogies of the first emperors, see the article about Agrippina the Elder on Pergamon gallery 2, page 8. Agrippina was Augustus' granddaughter, Agrippa's daughter, mother of Caligula and grandmother of Nero. southeast corner of the Lower Commercial Agora (the Tetragonos Agora). Compared with the decoration of carvings and inscriptions on the front of the gate, the rear now appears quite bare. Around the edges of the agora square are rows of Corinthian columns which formed the stoa (colonnade) sheltering the front of the shops. Behind the gateway, to the left is the white plastic roof of the Terrace Houses, and to the right the top of the facade of the Library of Celsus. In the backgound is the steep north slope of Mount Koressos (Bülbül Daği, Nightingale Mountain), along the top of which the fortification walls of the city were built during the Hellenistic period.